Red River Fishing better than the Lake Texoma fishing? 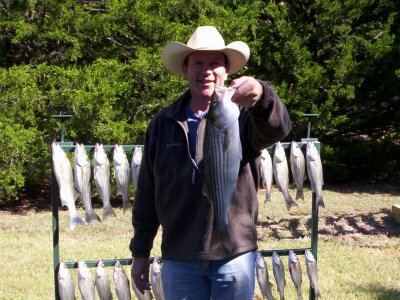 We recently came across and article from one of Lake Texoma's guides. This article published on the Fort Worth Star Telegram web site at http://www.star-telegram.com/sports/v-print/story/283378.html related that the fishing on Lake Texoma basically sucked while the fishing on the River was fabulous. We at striperguidefishing.com are not guides. We do however, know many guides who fish from the Little Mineral of Lake Texoma and from the Highport Marina side of the lake. We saw this article around the middle of last week. It had been published on October 28th. We were surprised at the section that reads……..
"Anglers in the know are racing to the tailrace in the Red River below the dam of the Texas-Oklahoma border lake. "Texoma is a great lake, but, just like the river, it has its good times and its bad times, depending on water levels and quality. Right now, the lake is the worst I have seen it in five years, and the river is the best I have seen it in five years." We have been out on the lake two times in the week prior to the 28th and once this past week. On all three occasions we have flat not seen the dismal conditions reported by Mr. Barnes. We have caught several good sized fish in the 5-9 lb. range. The fish we caught were by no means "so poor that you can't get a fillet off the side of them." We were wondering if we were just that good or lucky to be in the opposing predicament Steve reported to be in so we asked some of the guides we know what the the size and condition of the stripers fish they were catching was. All reported that the fish are of good size and in good health, many fat bellied. The bigger fish we caught on shad hit and fought hard, just the opposite of "And they have little fight when you catch them. ", that Mr. Barnes reports. Again we asked our guide friends and they confirm what we personally saw. There is much head scratching going on as to why this report was so negative to the lake fishing. We have no vested interest in the debate, other than knowing where we like to go fish to put fish on our plate and a desire to provide our readers as much good information on Lake Texoma stripers as we can. We visited Mr. Barnes web site and saw that he does do a lot of airboat fishing on the red River. We are not here to make any assumptions of the motives. We just think it benefits the fishermen who are considering fishing for stripers on Lake Texoma to be given the most up todate correct conditions of the fishing on Lake Texoma. We think that this gives prospective texoma anglers another tool to help them when they are thinking or planning a striper fishing trip on Lake Texoma.